by Julie on June 9, 2015 » Add the first comment. 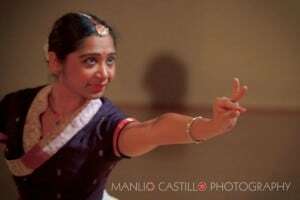 Teaching artist Subashini Ganesan in a performance of Bharathanatyam (Traditional South Indian Classical dance). Teacher, dancer, maker-of-happenings and opportunities: Subashini Ganesan has the rare ability to juggle 100 projects without ever forgetting to smile, say hello, and ask how you are doing. As a teaching artist, Suba has worked with Young Audiences since 2010, presenting residencies on her own and performances through her company Natya Leela Academy. If you haven’t had the chance to see Suba in action, catch her newest performance this weekend on June 13 at PSU’s Lincoln Hall (read on for more!). What is your art practice outside of teaching? I am the Artistic Director of Natya Leela Academy where I choreograph contemporary works to express the universal emotional depths present in South Indian Classical Dance. My works have been showcased at local and regional festivals including Ten Tiny Dances, Conduit’s Dance +, NW Folk Life Festival, and the Salem Library’s “World of Music.” I am also the recipient of several grants from the Regional Arts and Culture Council (RACC). Natya Leela performes on a 4×4 stage as part of 10 Tiny Dances. I am also the founder and Director of New Expressive Works (N.E.W. ), a recently incorporated non-profit arts organization in Oregon that supports and promotes choreographers of diaspora and emerging artists to develop works of artistic excellence. In 2012, I became the Director of Studio 2@ Zoomtopia (810 SE Belmont) and launched the N.E.W. Artist Residency Program which continues to provide sustainable opportunities for choreographers from all levels in their professional careers to create new works. What fuels your creative practice? My rigorous exploration of ways to keep expressing universal emotions through my foundational art form, Bharatanatyam, is a major inspiration for my teaching and my artistic practice. Collaborative creative practice, rehearsals, and engaging in conversations with professional performing, visual, movement, and vocal artists are also ways I keep pushing my ways of thinking about dance and expressing new works through my body. Subasini dances in a duet with a fellow Natya Leela dancer. Tell us a little about your latest project? 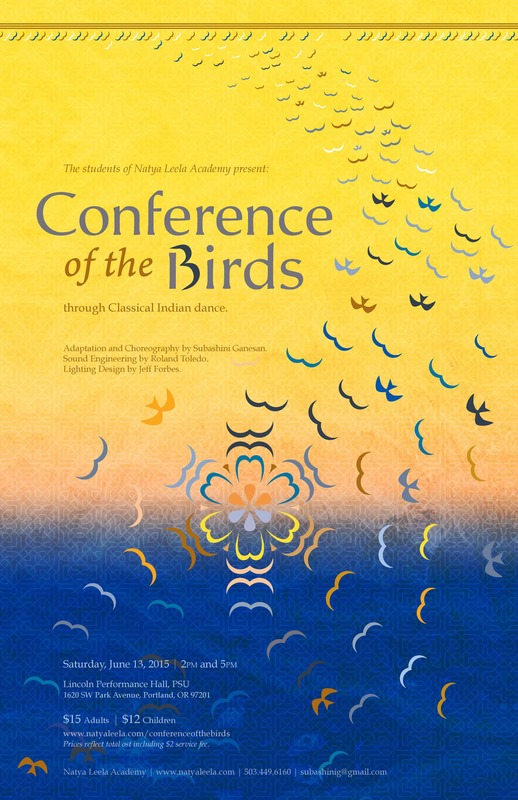 On Saturday, June 13th my dance school [Natya Leela] will present the first ever Indian dance adaptation of “The Conference of the Birds” or “Speech of the Birds,” a 12th Century Sufi poem of approximately 4500 lines written in Persian by the poet Farid ud-Din Attar, who is commonly known as the Attar of Nishapur. This original choreography will come to live in Lincoln Hall and my artistic work is accompanied by Roland Toledo (sound engineer) and Jeff Forbes (lighting designer). 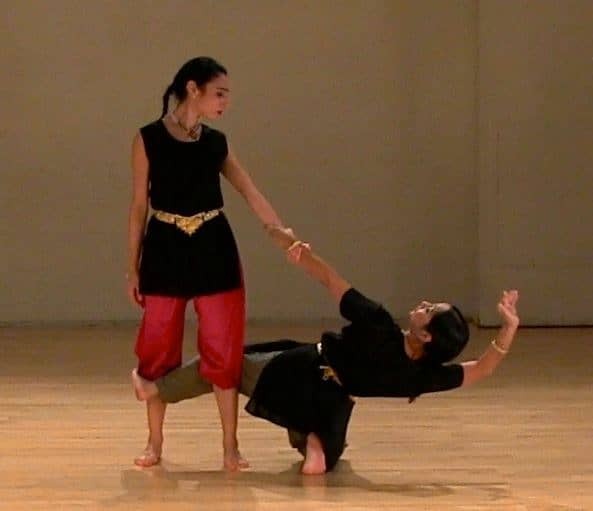 Through Classical Indian dance, my dance students will take you on a thoughtfully meditative journey into human desires, the longing for inner meaning, and the outcomes of such a quest. Students at Natya Leela Academy. 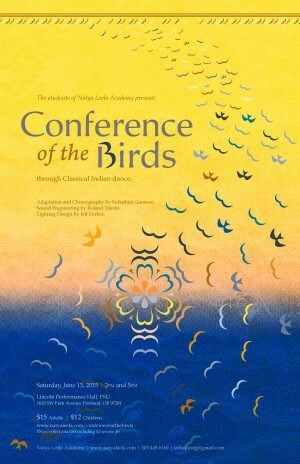 Conference of the Birds will be performed on Saturday, June 13 at Lincoln Hall at 2 & 5pm. The story in this adaptation is as follows: The birds of the world gather to journey to meet their mythological king, the legendary Simorgh, a mythical Persian bird (roughly equivalent to the Western phoenix). The hoopoe, the wisest of them all, and the only one who knows the path, leads the birds on this long and arduous journey. Unbeknownst to the travelers, they are embarking on a spiritual quest of discovery. They experience the tragedy of worldly desires, the meaning of true love and consequent shedding of the ego. Many birds abandon the path along the way, but the eventual few who reach the dwelling place of the legendary Simorgh, find only a lake in which they see their own reflection. 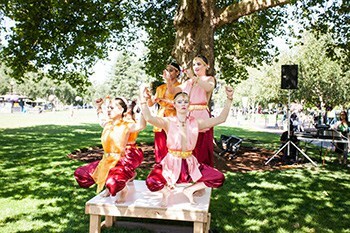 See Natya Leela perform at 2pm and 5pm on Saturday, June 13 at PSU’s Lincoln Performance Hall (1620 SW Park Ave). Tickets are $12 (children), $15 (adults) and available HERE. If you are feeling inspired to try your hand at Bharathanatyam, check out Suba’s full line of classes for kids and adults. 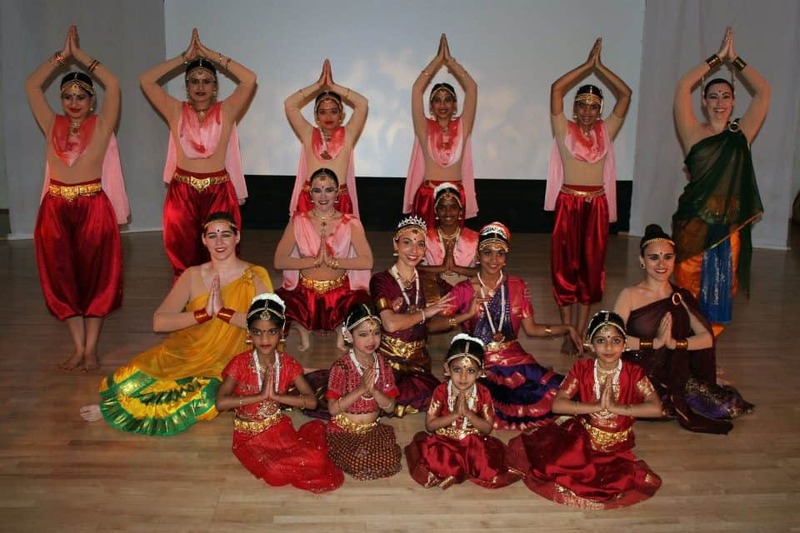 To schedule a residency, workshop, or performance with Suba or Natya Leela Academy, contact School Liaison Josephine Kuever at 503-225-5900 x231.